Keep an eye out for the fun Woodland Park Zoo busboards, billboards, and radio commercials featuring our new penguin exhibit--now "more colorful than ever" thanks to an all new exhibit design that lets penguins swim, sun, dive, splash and porpoise the day away. Explore the exhibit, play games, and download colorful penguin desktop backgrounds at http://www.morecolorful.org/. A family-favorite for more than a quarter-century, we’re proud to introduce our exciting summer concert series lineup and a new partner, BECU! We’re also pleased to announce returning presenting sponsor Carter Subaru and our ticketing sponsor, Metropolitan Market. Tickets will go on sale on Monday, May 4 at 8:00 a.m. at local Metropolitan Market stores, and in limited quantities at the zoo and BrownPaperTickets.com. For complete ticket information, performer bios and shuttle, parking and directions, visit the official ZooTunes website. Which shows do you plan to catch? Photos and emails are trickling in from WPZ staffers who are currently up in the mountains of Papua New Guinea, celebrating what may be one of the most inspiring Earth Day stories this year. 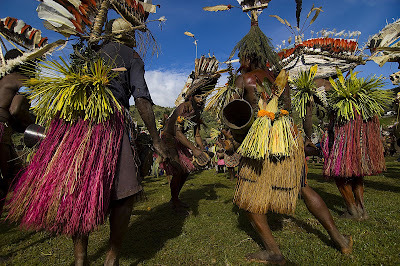 On Earth Day yesterday, thousands of Papua New Guinea villagers gathered in the Teptep village on the Huon Peninsula to hold a traditional Sing Sing, or celebratory gathering, to honor the creation of their nation’s first national Conservation Area. The new YUS Conservation Area—187,000 acres of tropical forest made up of land donated by 35 local communities—will be protected forever from hunting, logging and development. Joining them at the Sing Sing were Woodland Park Zoo Tree Kangaroo Conservation Program staff, representatives from Conservation International, and dignitaries of Papua New Guinea including the Acting Prime Minister—as it is the 12-year culmination of our work together with the villagers of PNG that has brought about this conservation milestone. Woodland Park Zoo is honored to be part of a great Earth Day for everyone. Photos provided by Ryan Hawk (Woodland Park Zoo) and Bruce Beehler (Conservation International). There are many ways you can celebrate Earth Day in your own backyard and in your community! - Share how you're spending this Earth Day, Week and Month: Feel free to post your plans in the comments section and share links for your favorite eco-projects. 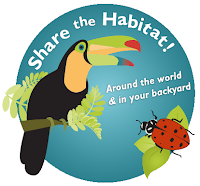 Together, we can share the habitat! We are really excited about a new project. Woodland Park Zoo and The Greenwood Collective are inviting artists of all experience levels to participate in Penguins on the March, a community art project designed to celebrate the zoo’s new penguin exhibit, spotlight Seattle’s arts community and benefit Woodland Park Zoo’s field conservation projects around the world. 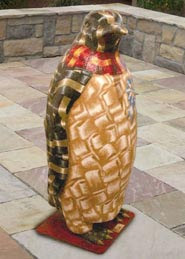 Artists are invited to paint, embellish and decorate 22-inch fabricated penguins by the end of May. Penguins on the March will be unveiled at the Space Needle in early June. The artist decorated penguins will migrate throughout Seattle neighborhoods (including Fremont and Ballard) landing at The Greenwood Collective during the July 10th monthly art walk for a silent auction to benefit the zoo’s field conservation projects. For more information, contact penguins@urbanlightstudios.com or call (206) 913-2835. 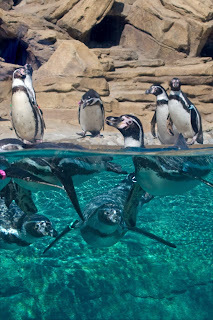 Watch the penguins explore their new exhibit for the first time and see some of the amazing underwater views visitors will get when they visit. And don't forget to turn up the sound for full effect! The all new exhibit transports zoo visitors to the desert coast of Punta San Juan – home of the largest colony of wild Humboldt penguins in Peru. Watch the video for a peek at the shoreline cliffs, nesting burrows, rocky tide pools, crashing waves and sunny beaches in the naturalistic new home for penguins. And with special windows and acrylic walls, dramatic vantage points will offer guests nose-to-beak viewing as penguins splash, dive and swoop underwater. See it all for yourself when the exhibit opens on May 2! Head flagging: They all stretch their necks up high like they're trying to peek over a wall and then start turning their heads from side to side. At first just a few them are doing it, then more and more, and after awhile they are all in synchrony. Wing saluting: At first it looks like one or two might be just stretching one wing or the other. One does it, then another, and as it progresses through the flock it gets faster and faster where each one is whipping out one or both wings and drawing them back in very quickly. Marching/parading: While they are head flagging, the entire flock will begin moving in one direction or another and march back and forth across the exhibit. We expect these behaviors to increase in intensity over the season, but at this time they seem to be most active in the morning and late afternoon. Sunshine also seems to get them going, so on a cloudy or rainy day you might not see them being very active, but even if the sun comes out for just a little while they often react to it. 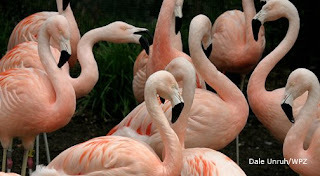 Hopefully this will all lead to nest building, egg laying, and baby flamingos. Photos by Dale Unruh and Zoo Corps. The new colony of Humboldt penguins was introduced today for the first time to Woodland Park Zoo’s new penguin exhibit, and boy was it a thrill to watch! 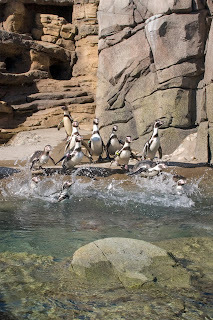 The 20 tuxedoed birds waddled outdoors onto the beach and naturally did what penguins in the wild do—go swimming! Up until today, the penguins (10 males and 10 females) had been in standard quarantine in the interior enclosure of the new exhibit as part of our excellent animal care program. They arrived three weeks ago from five other zoos and aquariums, and had been behind the scenes getting used to each other, their keepers and their new daily routine. After showing great signs that they were adjusting well, the penguins were ready to take their first steps outside since arriving—and what a day for a debut with the sun shining and the water glistening blue! 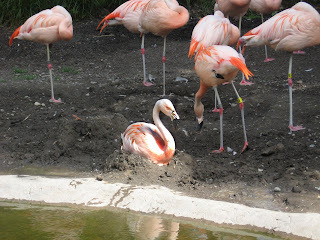 The birds wasted no time in exploring the depths of the pool, the sunny beaches and the shady nooks of their exhibit. Some even built up speed and porpoised into the air! The penguins’ introduction proved a moving moment for Woodland Park Zoo staffers who have put countless hours into planning and building this exhibit. OK, I admit it: some of us even shed a few tears at the sight of our penguins delighting in their new digs. The colony will spend the next few weeks adjusting to the new exhibit, exploring the boundaries and finding favorite spots—just in time for our highly anticipated opening day on May 2! Photos by Dennis Dow and Ryan Hawk.